The stretch of the River Thames at Hampton contains a number of islands, usually known as Aits or Eyots. The number of these islands has declined over the years with improvements to navigation and many have had name changes due to changes of ownership. Of the islands that exist today Platt’s Eyot, at the far western end of the parish, is one of the largest. It now houses some boat repair business and light industry, although plans for housing arise from time to time. Up to about 1884 it had been used for growing osiers (willow rods used for making baskets). In 1888 an intake for the filter beds on the adjacent Waterworks was formed on the island. Between 1898 and 1901 further nearby filter beds were constructed and the excavated soil dumped on the island, raising its level considerably. The island also housed the firm of Immisch & Co., boatbuilders, who marketed a famous range of electric canoes and launches. Later the firm was taken over by Thorneycroft’s and fast naval craft were built; later the firm’s boatbuilding operation was transferred to Southampton. Downstream from Platt’s Eyot, near Hampton Ferry, is Benn’s Eyot, a tiny island completely covered by Hampton Sailing Club; it is connected to the shore at the end of Benn’s Alley by a chain ferry. The next island is Garrick’s Ait, just downstream from St Mary’s church. For many years it was used for camping and picnicking and there were no permanent buildings, but later, in the 1920s and 1930s, plots were rented and later buildings appeared. Initially there were tents on the plots, followed by canvas-sided cabins, then wooden cabins and now many have been re-built with bricks and other modern materials. A large fire at Easter 2003 destroyed three houses. The next tiny island, sometimes known as Duck’s Eyot, is at the head of Tagg’s Island and only has room for a few ducks and waterfowl. The much more substantial Tagg’s Island is just below this island and is surrounded with houseboats. In the 1850’s there was a ramshackle beerhouse here called the Angler’s Retreat. In 1868 Tom Tagg moved to the island where he established a boatbuilding business, and in 1872 he took over the lease of the pub and built the Island Hotel. 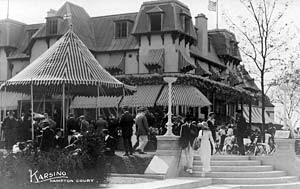 Later the island was leased to Fred Karno, the well-known impresario, who opened the Karsino here in 1913. This was a most luxurious complex. It was initially very popular, but the First World War intervened and it was never the same again, despite subsequent re-vamps and name changes to The Thames Riviera, The Palm Beach and The Casino. In 1940 A C Cars moved to the island and the first bridge was built to Hampton Court Road – the present bridge replaced it in 1982. The hotel was demolished in 1971 and after many development proposals and years of wrangling the centre of the island was excavated in 1983 to create a lagoon for mooring additional houseboats. Immediately below Tagg’s Island is Ash Island, which housed the Angler’s Retreat before it was transferred to Tagg’s Island, mainly to avoid flooding. The headquarters of Molesey Boat Club, founded in 1866, were initially on this island, although later they moved to the Surrey bank. Molesey Weir, originally built in 1815, extends from Ash Island to the Middlesex bank. The present day Hampton Riverside is depicted in these panoramic photographs from 2002.